Yonder is a 13 yr old FS Siberian Husky mix that presented for non pharmacologic pain management. Acupuncture was utilized to block pain conduction and myofascial tension release. Yonder is a 13 yr old FS Siberian Husky mix. Overall, Yonder remains high energy and active. She is restless at night, her owner feels that she is uncomfortable as she often shifts and changes positions frequently. Her owner describes her pain level to be a daily 2/9 with constant minor discomfort and occasional episodes of 7/9 pain. Last month, she was diagnosed with a left iliopsoas strain after stumbling down the stairs. In 2016, her owner began noticing mentation changes such as anxiety at night and depth perception changes. She described episodes of head tremors during which Yonder was not mentally present but could be roused out of the episodes. She received an MRI (head only) which revealed no structural abnormalities. Her owner noted that she used to carry her tail high and curled as a typical husky and now it hangs low and straight between her legs. She had a TPLO performed on the left stifle November 2013. A TPLO was performed on the right stifle July 2014. Her owner reports she never regained full function and muscle mass of the right hind limb after the surgery. She had an episode of biceps tenosynovitis about 7 years ago that was managed with cage rest and NSAIDS. She has lived with her owner since she was a puppy in Alaska. Growing up, she was used for daily skijoring. She eats Purina Joint Mobility, 1 cup BID. She is UTD on vaccines. No recent episodes of vomiting, diarrhea, coughing, or sneezing. No change in appetite or water intake. Gastrointestinal: Abdomen is tense, but non-painful on palpation; no overt organomegaly or fluid wave. Musculoskeletal: In normal stance, patient off loads right hind limb. Ambulatory x 4, ataxic gait with shuffling of hind limbs, occasionally knuckling of either hind limb, reluctant to flex either stifle, occasional prominent limp in right limb; mild muscle wasting is noted in both hind limbs; pain on thoracolumbar and midlumbar spinal palpation, pain on dorsal tail jack, reluctant to flex neck in passive range of motion to the left; Significant crepitus on extension/flexion of left stifle, stifle is thickened, no heat/swelling noted. Pain on extension of left hip. During this exam, right stifle and hip were not evaluated due to patient reluctance. Myofascial: Muscles of thoracolumbar and midlumbar spine tense, “twitch” on palpation, cervical muscles thick and ropey. Note: Yonder was anxious and resistant to touch and manipulation. When reflexes were evaluated, she became very vocal and defecated. These diagnostics were not pursued. The remainder of the examinations were performed with minimal painful manipulation (i.e full extension/flexion of the right hip and stifle not evaluated, rectal dorsal pressure for lumbosacral pain not performed, very light palpation of cervical musculature performed, etc). From a gait analysis stand point, Yonder has multiple episodes of losing her footing on the tile, tripping, and stumbling during each session. When walking, she often threw her back legs forward in an attempt to avoid flexing either stifle. The right stifle was especially stiff with mild circumduction of the leg in ambulation noted. Toe nail scuffing could be heard. She would often off load the right limb when standing. Her back remained stiff during ambulation which I interpreted as off loading the pelvic limbs and compensating by throwing weight into the back muscles. On cervical passive range of motion, she refused to turn her neck to the left when prompted with a treat. Passive range of motion to the right was uneventful. A light myofascial palpation was performed. Yonder was very resistance to palpation of the cervical muscles. A very brief examination of these muscles revealed bilateral taunt, ropey bands. Longissimus and iliocostalis were very tense and twitched on light palpation. The sartorius was bilaterally very taunt and tender. The iliopsoas was not palpated due to patient reluctance. These abnormalities are unsurprising considering how long she has been compensating for bilateral stifle and hip pain. Orthopedically, the left and right stifle palpated thick with a loss of normal boney architecture. Flexion and extension of the left hip and stifle were reduced and painful. The right hip and stifle was not evaluated due to patient resistance. A dorsal tail jack was painful to the patient. Moderate pain was noted on spinal palpation approximately T11-L4. Neurologically, cranial nerves were intact. Conscious proprioception was intact on all four limbs. Hind limb reflexes and further proprioception testing, such as hopping, was unfortunately, unable to be pursued. Depth perception deficits were noted on multiple occasions where the patient would often bump into a corner or miscalculate how far to reach for a treat. Tentative diagnosis are speculative based on history and physical examination findings. Stance analyzer shows mild off loading of right front limb and right hind limb. All three above differentials are valid and possible. The main goal for Yonder was pain management. Based on her physical examination and myofascial palpation, she had orthopedic discomfort and secondary compensatory myofascial dysfunction. Stifle points, ST 34 and 36, were chosen to stimulate femoral and fibular nerves. Hip points, GB 29, 30, BL 54, were chosen for cranial gluteal and sciatic nerve stimulation. Back points spanning T10-S2, including both paraspinal BL points and spinal GV points were chosen to stimulate cranial cervical, cervicothoracic, cranial thoracic, midthoracic, caudal thoracic, thoracolumbar, midlumbar, S1, and S2 spinal nerves. Bladder points were also used to locally affect taunt muscle bands. Note: An L or R denotes the side the needle was placed. Needles were provided by Michigan State University College of Veterinary Medicine. 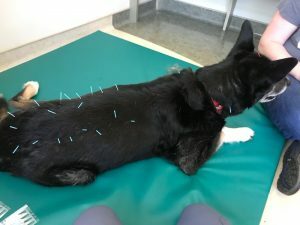 Yonder has never received acupuncture before. During this treatment she was anxious. I elected Fewer needles were placed and electrical stimulation was not pursued at this time. Needles were placed and kept in for 20 minutes as in all subsequent sessions. A client assessment was made during each subsequent acupuncture session. Overall, the client felt that Yonder’s short strided/ choppy hind limb gait was less noticeable. She felt that Yonder was less restless at night which she interpreted as decreased discomfort. A subjective assessment of Yonder’s progress was made by the author. Extension of the left hip was significantly better with no discomfort on flexion and extension and full range of motion was possible. Spinal palpation elicited no pain. Myofascial evaluation of the back revealed tense longissimus and iliocostalis however, no “twitchiness” or exaggerated discomfort was elicited as in the first evaluation. Passive range of motion of the neck was rewarding with no discomfort or reluctance to fully flex on either side. Overall, Yonder showed a positive response to therapy. Gait analysis post treatments shows a longer strided gait in the hind limbs with less bunny hopping. While Yonder’s gait didn’t show immense improvement, the assessment of range of motion and myofascial palpation as mentioned above was quite dramatic. I personally loved this case. Prior to a physical examination after the last treatment, I wasn’t sure I had made much progress in managing Yonder’s discomfort. However, being able to full extend and flex her hip and palpate her spine without eliciting pain was incredible! Going forward, this is a modality I will offer to all my future clients as a non pharmacologic treatment of chronic pain. 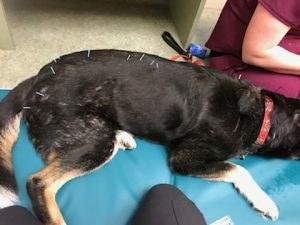 “Effect of Acupuncture on Pain and Quality of Life in Canine Neurological and Musculoskeletal Disease.” The Canadian Veterinary Journal, Sept. 2017, pp. 941-951. Pubmed, www-ncbi-nlm-nih-gov.proxy2.cl.msu.edu/pubmed/28878418.